Penny Ann’s makes me happy. I won’t lie–I’m a sucker for any business that remembers my name. And Penny and her family have remembered me from day one. I walked in for lunch today, and Penny immediately says hi, followed with “I was thinking about you today!” Welcome home. I love that their restaurant is a family business. Penny can be found up front serving guests, and her brother, Warren, is the chef. Sisters, brothers, and parents are all present, clearing tables and prepping food. They have a large selection of items on their menu. You’re not going to see Korean tacos, lavender-infused pork belly, or anything that could be described by the word fusion. Penny Ann’s offers the epitome of comfort food. You’ll find chicken parmesan, turkey melts, meatball subs, fish and chips, and Philly cheese steaks gracing their menu. Nine times out of ten, however, I go with the Reuben. They make their corned beef in-house, and it shows. 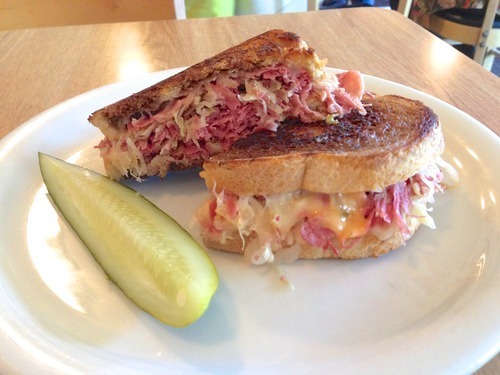 Ever since I had a Reuben in New York (thank you Katz! ), I regularly crave it. And I go to Penny Ann’s to satiate the craving, because it is a near-perfect rendition. Tender, peppery corned beef is sliced thin and partnered with sauerkraut and just the right amount of Thousand Island dressing. The bread is crisped to perfection. One of my favorite dishes in SLC. Their fries are delicious as well, but if you’re an onion ring fan, I’d highly recommend you swap the fries for onion rings. You won’t be disappointed. They have just the right amount of breading, and they serve it along with their tasty version of fry sauce. And don’t think you can leave Penny Ann’s without ordering a piece of pie. The pies are made by Penny’s mother, I believe. They have banana cream, coconut cream, key lime, and lemon raspberry cream in their regular rotation, among many others. My wife particularly loves a special pie they make from time to time with blueberries. I believe it’s called blueberry paradise. I never dare leave Penny Ann’s without a slice of blueberry paradise in a to-go container. 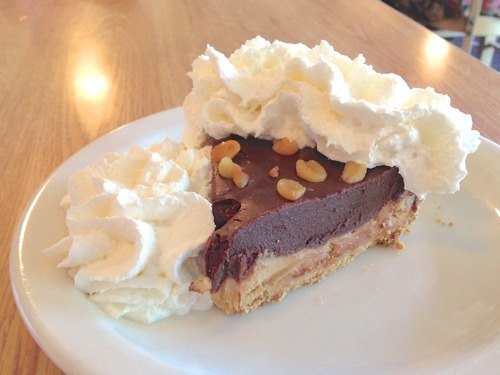 A portion of their peanut butter chocolate pie usually comes home with me as well. It’s such a rich affair that even this sugar junkie can only eat about half before throwing in the towel. I’m just going to say it: their prices are ridiculously low. I know–that makes me the kid who would remind your teacher about the assignment due that day. But it has to be said. Their reuben is $6.99, and for an additional $2.50 you can add fries or salad and a soda. I’m pretty sure they don’t have anything on their menu over $10. They are located in a bit of a culinary No Man’s Land, with Pho Tay Ho one block north and Grove Market one block south, but not much else. Look for a big, cream-colored apartment building–their restaurant is attached to this building. They used to offer dinner service but have since changed their hours (probably so their family can get some much-deserved sleep). They are now open from 7am to 4pm, Monday through Saturday. These guys deserve your business. Not just because they’re local or family-owned. Penny Ann’s deserves your business because their food is outstanding, their prices are exceptional, and their service is excellent. And I can guarantee you won’t leave hungry.